The system consists of multiple components allowing us to rapidly index and search through large collections of documents or metadata describing your images, videos, recordings or business data; this allows us power a strong annotation capability. In addition, the system contains customizable worker components which enable distributed asynchronous batch execution of high computation and/or high latency tasks. 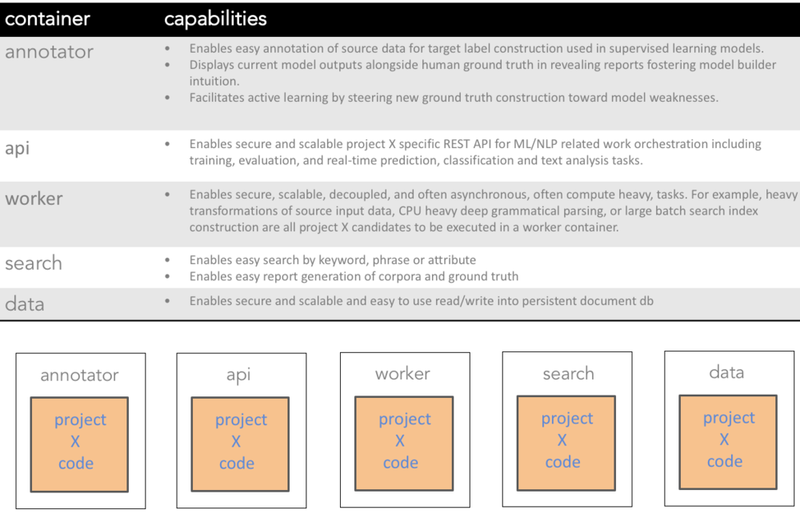 For example, if we need to perform an analysis against an entire audio recording, because this is a compute heavy task, this functionality would be executed in the worker. In addition, an API server exposes all functionality to your application for easy integration. The system is operated within encapsulated docker containers which contain all dependencies required to run your code. These containers ensure that the exact same environment used to test your model is used at execution time -- no library compatibility or compilation problems. Each component of the Mayetrix system is built with fault tolerance and scale in mind. Your system can be deployed very simply and cost efficiently during early prototypical phases, but when we get to production, redundancy becomes more important. In addition, we might need to add more instances as your system needs to accommodate more data and as your user population continues to grow. Our operational environment running the Mayetrix system make this easy.